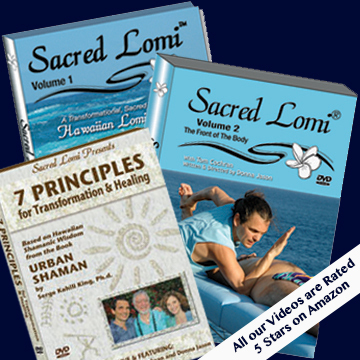 5 Star-Rated DVDs on Sacred Lomi and the 7 Principles of Huna, produced with aloha, love and extreme attention to detail by Sacred Lomi. Journey with Serge Kahili King, Tom Cochran and Donna Jason as they explore how these principles apply to bodywork, healing and life transformation. 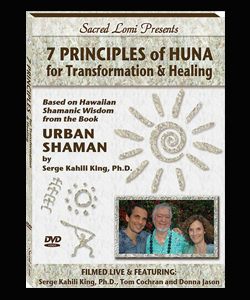 Filmed with a live audience on location in Pahoa, Hawaii, this DVD is full of life changing gems and insights that can be applied to any endeavor or practice, including all forms of healing and education. 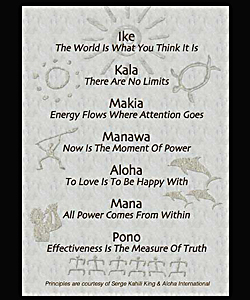 Learn the 7 Principles Chant • Receive six 5 x 7 printed card of the principles! Running time: approximately 58 minutes • Plus 32 minutes of bonus material.